Accepting the challenges of fast-paced ever-changing GSM market, we generate innovative ideas to implement into Smart-Clip2 software and provide you with solutions that any other boxes do not offer. Today we proudly present you our latest development - the one and only service support for the most popular ZTE Qualcomm Hexagon smartphones. Keep your software up to date and enjoy the unique benefits of Smart-Clip2! Service support without rooting for devices on Android 4.4.2 / 4.4.4. 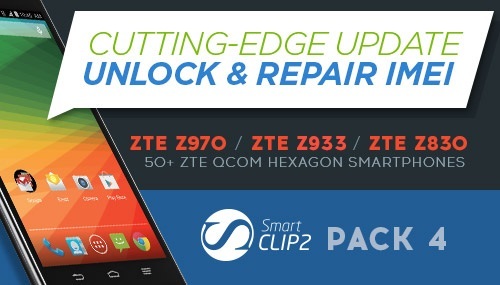 Fast Direct Unlock database has been updated with new firmware version for ZTE Switch X1: CELLCOM_LR_P727D50V1.0.0B03. Smart-Clip2 root solution: updated list of models supported with "Autodetect" feature.